Not all agricultural land is covered b y Cadastral maps (Kwin maps). 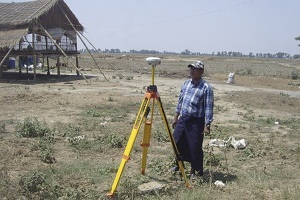 LAMP designed and demonstrated a process for expanding coverage of rural cadastral mapping in unsurveyed agricultural land by using the GNSS surveying system and information, education and communication (IEC) activities in a farmland area of Thayarwaddy Township, Bago Region, in 2015. The total unsurveyed area in Thayarwaddy is about 4,000 acres. The farmers had not been exposed to formal land surveys and knew little about the Farmland Law. There were no suitable base maps for the area and no nearby survey control stations. The community is farming low lands which are usually flooded during the rainy season. In the winter season (i.e., from November to February) some farmers grows rice, mung-bean and peas. Thatching grass is growing naturally in this area. In the summer season (i.e., from March to April) most of the farmers harvest the thatching-grass for making thatched roof. The approach was to start with community entry and an IEC program on First Time Land Adjudication and Titling to the farmers and Village Tract committee on Farmland Administrative Body (VT-FAB). 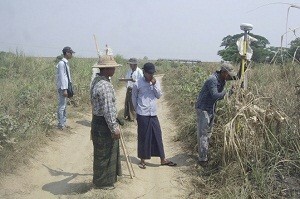 After the IEC campaign, all farmland landholders were informed on the survey schedule for readiness of the field visit. Demarcation, adjudication and surveys were carried out simultaneously with full participation of the farmers and VT-FAB. After finishing the field work both the printed cadastral map (Kwin map) and landholder list were placed on public display. All interested persons have the right to view and give confirmation of the data, offer correction or make objection during the public display. A book for recording corrections, complaints and objections are maintained by the Village Tract Administrator. The ground features are obscured due to the thatching-grass making satellite imagery not effective. With little visible ground features the GNSS survey method was appropriate using RTK mode. LAMP established 10 third order survey control stations in Thayarwaddy from the national second order network to support all its work in the Township. From a pair of third order stations one survey base station was established at the centre of the Kwin map. The periphery of the Kwin map was surveyed first to ensure joining with adjacent maps and surrounding topographic features. The field team and local authorities jointly perform adjudication and land surveying of the holding. For each holding LAMP Form 1 is used to collect data on land adjudication including that on the spouse and other family members and also details of any secondary rights on the holding (e.g. sub-lease). LAMP Form 2 records each holding’s boundary by the agreement of adjoining landholders, evidenced by signatures. Survey data is processed at the Township Office of the Department of Agricultural Land Management and Statistics (DALMS – formerly SLRD) and the title application is processed by the VT-FAB. Although the hatching-grass made the work more difficult all land holders could show the boundaries and there were no land boundary disputes between neighbo urs. The Public Display of map and list of owner of land use rights is a very important part of the total process, helping to ensure transparency and building confidence of the people in the systems of the DALMS. Farmers are invited to attend the public display and give confirmation of the data or offer correction. In accordance with Farmland Rules, 2012 Section 14, the Township FAB issues official documents i.e., Certificate of Farmland Use Rights (LUC) to the farmer. The registration fee for the title of each holding MMK 500 as prescribed in the SLRD Notification No 1/2012 dated 1 November 2012. All work was conducted by the DALMS staff with technical assistance of UN Habitat’s technical team. The new methods are documented in a work instruction. 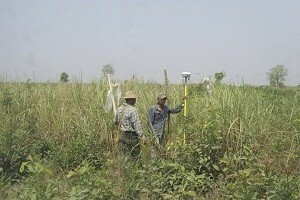 The method of GNSS survey was more applicable in this case since the ground features were not well visible.